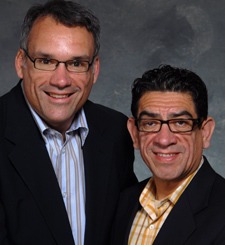 Barajas ( right ) and his partner Kasey Reese are former Chicagoans active in numerous gay and Latino groups. The couple, together since Sept. 4, 1993, now lives in Vancouver, Canada. Barajas' volunteer work included: ALMA ( Association of Latin Men in Action ) , AIDS Walk Chicago, CPNA ( Chicago's LGBT Professional Letworking Association ) , Lambda Legal, Equality Illinois and LCCP ( Lesian Community Cancer Project ) . His board work included ALMA ( including as president durinbg their transition to 501-c-3 non-prfit status ) , the city's LGBT advisory council, the state's attorney's advisory board, Lambda Legal and Project Vida. See also Kasey Reese's video entry.